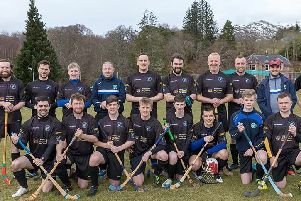 Lewis’ shinty ladies again acquitted themselves more than ably at Cannich this weekend. On their third outing at the Marine Harvest Development League they won 4 and drew 2 matches on the day. They drew 0-0 with League leaders Lochaber and secured a notable 3-0 victory against home side Strathglass. They also beat Glenurquhart 1-0, Ardnamurchan 1-0, Fort William 1-0 and drew 1-1 with Cowal and Bute. Poppy Taylor scored six goals with Demelza Anderson grabbing the other Lewis strike. Kelly MacKay in goals with Anna Macrae as defensive lynchpin maintained Lewis’s excellent defensive record.Other team members were captain Alicia MacSween and Nicola MacLeod. Meanwhile this Saturday the senior team take on Kilmallie at Sgoil Shiabost throw up 2.30pm. There is an open junior competition beforehand. Registration is at 10am.at the school. All wecome.Thig ann!